Landlords who break the law by exploiting their tenants should have their properties confiscated, a committee of MPs has concluded. Members of the Housing, Communities and Local Government (HCLG) committee said vulnerable tenants needed greater protection. Many face retaliatory evictions, unfair rent increases and harassment. During its inquiry the committee heard that up to 25 people could be found living in three-bedroomed houses. It also found landlords who charged tenants up to £500 for a bed in a room with four bunkbeds. 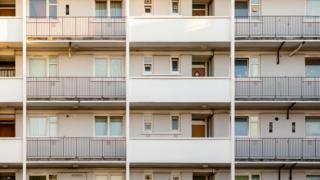 The HCLG committee said local authorities should be given powers to confiscate properties from the worst landlords, or those who consistently exploit vulnerable renters. "The imbalance in power in the private rented sector means vulnerable tenants often lack protection from unscrupulous landlords, who can threaten them with retaliatory rent rises and eviction if they complain about unacceptable conditions in their homes," said Clive Betts, chair of the HCLG committee. "Local authorities need the power to levy more substantial fines against landlords, and in the case of the most serious offenders, ultimately be able to confiscate their properties." However, one campaign group said the MPs had missed an opportunity to go further in their recommendations. "The law is supposed to protect tenants from these criminals but many won't complain about squalid conditions out of fear that the landlord will retaliate with a rent rise or eviction," said Dan Wilson Craw, the director of Generation Rent. "Councils are in a position to dispel such fears, but too many are failing to take meaningful enforcement action in response to complaints. They must do more to assure private renters whose side they are on." Successive governments have already toughened the law on renting. Landlords currently face civil penalties of up to £30,000, and those who break the law can be banned from taking on tenants. But the committee said local authorities did not have enough resources to enforce the regulations. The Residential Landlords Association (RLA) agreed, pointing out that there are already over 140 Acts of Parliament and 400 regulations relating to the rental sector . "The problem is that over-stretched councils simply do not have the resources to properly use such powers to protect tenants from the minority of landlords who are criminals and have no place in the sector," said Alan Ward, chair of the RLA.